When Andre Christian was young, his life was in turmoil. He wasn’t happy at home and looked for things like stability, love and acceptance in the streets. Joining a gang gave him that… or so he thought. Living day to day through an endless stream of crime and senseless murders became taxing. But there were two things about Christian’s situation. One, was that he was blessed enough to make it out of gang warfare alive. The second, is that he had the wherewithal to think about an alternative. “I matured and basically got tired of the senseless murders, young guys being over sentenced,” he recalled. He found that through the Watts Life Car Club. He joined them in 1998, exactly 20 years after the club had been formed in Los Angeles. In 1978 a group of men loosely banded together to represent Watts in the popular street races and hot spots at the time. They officially formed the Individuals Car Club in 1980, consisting of members from other parts of L.A. County, like Compton, South Central and Gardena. Watts Life was soon to follow. It’s all about the cars, members said. The cars are what make people come together. 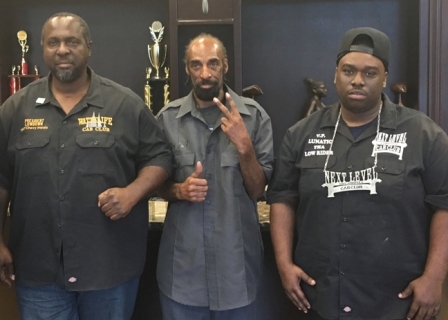 “Watts Life [members] are like our brothers,” explained Lunatic the Low rider, vice president of the Next Level car club out of Los Angeles. “We have members of rival gangs, Blacks Mexicans, Crips, Bloods… there’s not a lot of trouble when we have our events,” Christian added. “Bringing peace to the community is sometimes a fight because everybody doesn’t want peace,” Christian said. Except they did get far and it was due to forming significant and essential relationships with community leaders and community members alike. That’s what keeps the club moving in the right direction, Christian said. To that end, yearly events like the Winter Wonderland festival, The Thanksgiving Feed, and the Stop the Violence via the Safe Community Initiatives are what the clubs thrive on. “We are about brotherhood and trust, said,” Lunatic. “The biggest thing we see coming out of this is stopping the violence,” Christian said. “My goal is to keep the peace and have people enjoy life. We can cut down violence, our communities can live longer,” said Next Level President Bay Bay.